Soccer players often make good cross country runners. I remember our high school cross country coach trying to recruit many of us to the team because we had stamina (though I didn't take the bait). So it was no surprise that many of the fastest kids who ran cross country in Austen's 6th grade class were none other than soccer players. Cross country was good for those soccer players too. It help them build better stamina for those 40 minute halves when they couldn't get a sub. It taught them discipline and how to commit to training for something every day. It taught them if you work hard enough and are committed to something you'll surely see results as in you will get better and faster each week. I believe this was all true for Austen. 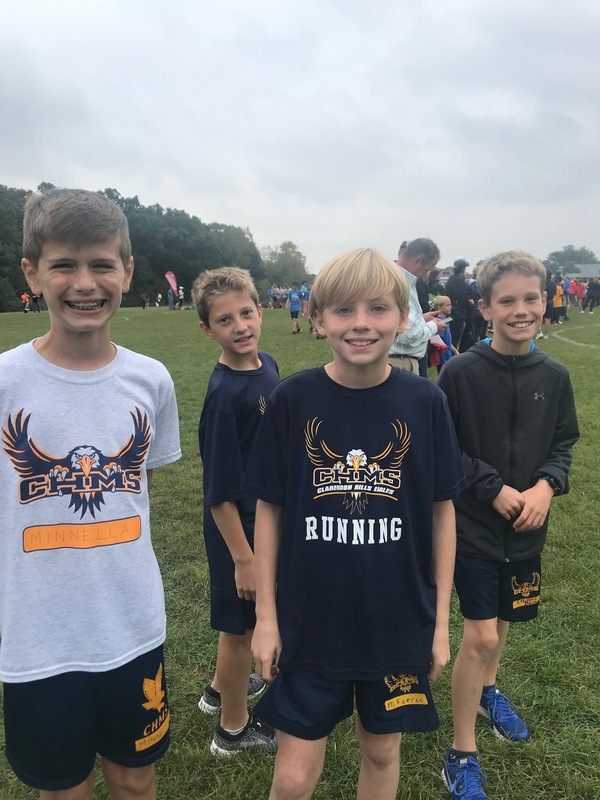 He finished the season at the conference meet which only the top 20 6th graders were invited to attend. Austen was one of the top 7 consistently this season. His last meet was a tough one though. It included two monster hills - one at the beginning and one at the end. He held in there running a tough race but he didn't get out fast enough in the beginning so he ended up trailing a bit behind his normal time. Add in those hills and I think he was hoping for a better finish than 28th place out of 180. (He really wanted a ribbon but only the top 15 get those). Something to aim for next year but he'll have to run 2 miles then. Still overall, a great first cross country season for Austen. And, he says he wants to do it again next year! When I showed Hailey this picture, right away she smiled and recognized the older woman (she had been in Hailey’s classroom last school year too). Hailey went on to tell me she was reading Ms. Mary Ann a book about snakes. I’m sure Ms. Mary Ann loved that book especially because Hailey can’t quite read yet but conjures up her own stories in her mind based on pictures in a book or ones she draws. I love her imagination and it’s evident Ms. Mary Ann does too. What a sweet and satisfying friendship between the two. On Thursday, Tom and I will celebrate our 15th wedding anniversary. And while this day reminds us of the beautiful September day when we got married, it also reminds us that not even a year later we purchased land in a Michigan beach town to some day build a beach house on to make memories with our future family. Well, nearly 15 years later we're almost there. We broke ground in June and the house is expected to be done before the end of the year. It took us 15 years. Three kids. Two dogs. Three condos/houses. We wanted to sell it when the recession hit and we were paying a double mortgage on our two city condos because we couldn't sell one. Luckily we had good jobs. So we held on. We wanted to sell it when we were paying more taxes for our vacant land than for our condo in the city. But we didn't. We kept paying the taxes and the mortgage. Eventually, we subdivided the large parcel of land into three lots selling two and keeping one for ourselves and paying off our own piece of land. We bought into the private beach and the tram system that would take you down to the beach instead of walking the stairs when we had the money so we wouldn't have to pay for it later. We contemplated selling our land again and buying somewhere else in Michigan where we would always vacation but we decided one summer to rent a house close to our land and explore the area to decide once and for all if that's where we wanted to be. After the week was over, we concluded it was. There was so much to do - beach, great restaurants, good shopping, wineries, apple picking, festivals, farmers markets you name it. We were within a short drive of it all. So we stayed. We always envisioned Adler would be alive when we finally built our beach house. It would be our country home and she'd have a yard and when she grew old we'd bury her in the backyard up there. Our kids will be 5, 9 and almost 12 by the time the beach house is finished. Sadie will be almost 3. It may have taken us longer than we anticipated to build but that makes the story of how it came to be so much better and more special. It did take time, but time is all we have now to make memories up there with our family and friends. Austen is having so much fun in middle school. He's enjoying switching classes and having different teachers as well as making new friends. He really took to heart what I said before school started about making sure there is no one sitting by themselves at lunch. There was a new kid whom we met during orientation who just moved from Nebraska. His locker is by Austen's so we met and talked with the the mom and kid a few times during our practice locker/schedule run throughs. I told Austen that if he sees someone sitting by himself/herself to invite them to eat lunch with you. The first day, he said, mom, I got to lunch a little bit late and I saw "the new kid" eating lunch by himself then I saw all my other friends sitting at another table. I went and sat down next to "the new kid" and starting eating lunch then my soccer friend and his friend joined us and another one of my friends and soon he wasn't eating alone anymore. In the interest of being social and making new friends, Austen also joined the cross country team. In his first race he had to run with 6th, 7th and 8th grade boys. He did great finishing in the top 6 for the 6th graders (who beat many of the 7th and 8th graders). Only the top 20 6th graders get to run in the district meet so I'm glad he's placing in the top 10 or so because if he continues he'll get to run that race too. Here he is running with his buddy Matthew and then finishing strong. This is the year for Peyton to try new things in an effort for us to find some activities that she really enjoys and can't live without doing. So in mid August, she joined the cheerleading squad to help root for our local 3rd grade football team. They had practice almost every day for two weeks prior to school starting. 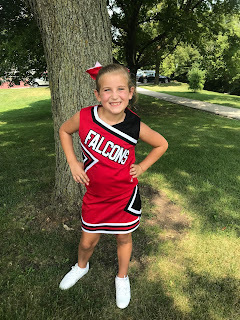 And, then once school started she's had to go to practice twice per week for 1 1/2 hours and then cheer on weekends at games. She's cheered at two games so far and it's been over 90 degrees both days. But, she did not complain! She was out there doing her thing and excited to be part of her team and socialize with the other girls. 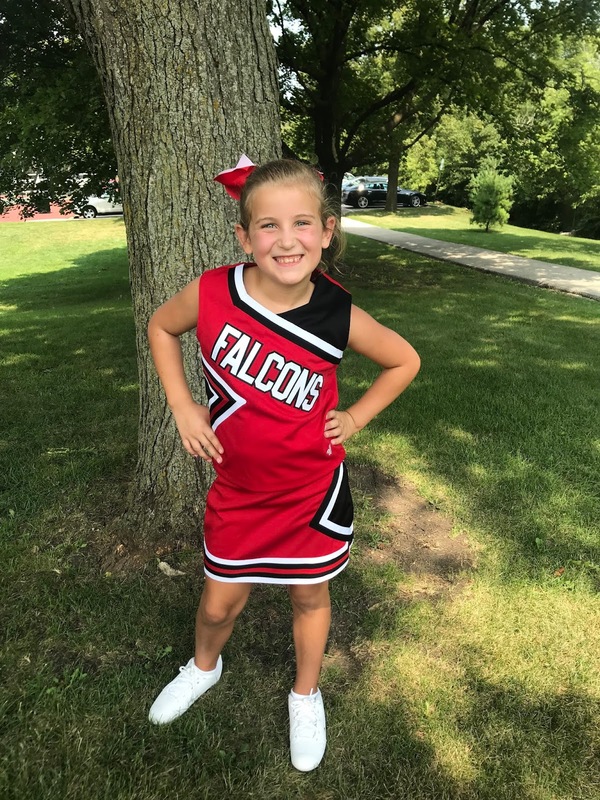 Her favorite parts are the high school cheerleaders that help lead her cheer team and teach them all the cheers as well as getting to shake hands with all of the football players after the games! Not sure if this one will stick either but she's having a lot of fun that's for sure! Here she is (second from left in the back) performing her "Dynamite" cheer.